Lila Marks describes Hawaii’s landscapes as “effortlessly beautiful,” but when the Eastern Mennonite University photography major traveled there this summer for her senior project, she had something else on her mind, too: Hawaii’s homelessness rate, the highest of any state. 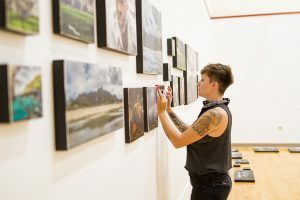 The resulting exhibit, called “The Ignored,” features 75 frescos showing Hawaii’s beauty but also portraits and candid portrayals of homeless people and images of and from the Boat Harbor, an organized community of “houseless” people led by a matriarch. The frescos range in size from 5×5” to 24×36” and are created by transferring a print made on plastic onto a wooden surface. Lila Marks adjusts artwork before the exhibit opening. The show runs Monday-Friday, Oct. 2-6 in the Margaret Martin Gehman Gallery, open during Common Ground Coffeehouse hours (7:30 a.m.–4 p.m. and 8 p.m. – midnight on weekdays) or by appointment by calling (540) 432-4360. An artist’s talk and reception with light refreshments will take place at 6 p.m. on Friday, Oct. 6. 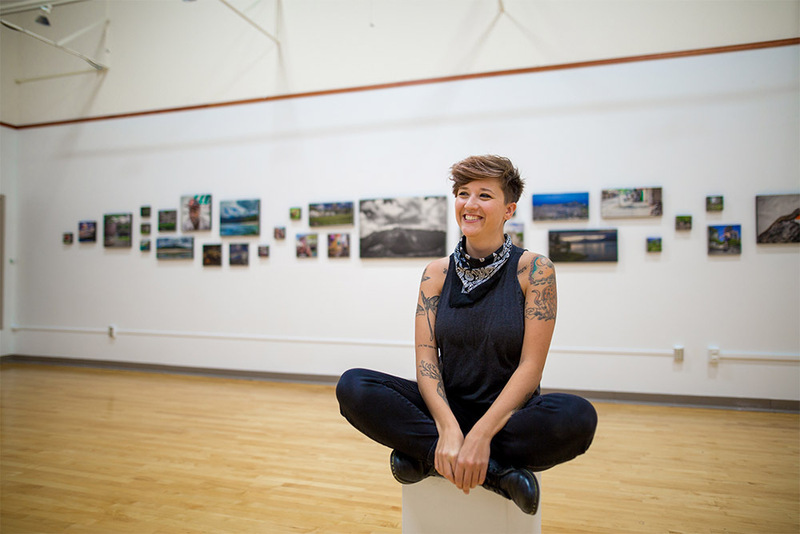 The senior show, required for photography majors, is one culmination of Marks’ education at EMU, a place she came to as an older transfer student with a goal of becoming a more skilled photographer. Marks said that becoming a photographer and studying at EMU started on a whim. She’d been studying global affairs at another university, but didn’t feel passionate about her coursework. She dropped out, and used her student loan money to buy a camera. “It was for no reason,” she said. “I had never really taken photos. I just thought I should do it.” She started taking a lot of pictures, “filling up memory card after memory card,” learning, getting better. 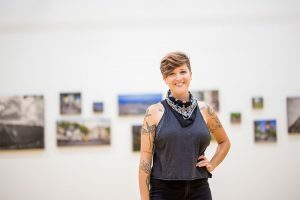 Eventually, at age 25 and living in Harrisonburg, she realized that she couldn’t imagine her life without photography in some capacity. Lila Marks, a transfer student from Washington D.C. area, hopes to return to Boat Harbor in Waianae. A portion of the proceeds of her sales will be donated to the homeless community there. For this project, though, Marks was drawn to Hawaii, where for most island visitors homelessness is just a disregarded subtext overshadowed by natural beauty. The exhibit’s title “The Ignored” has two meanings. First, it reflects the reality that society often ignores homeless people. “We’d rather not see them or deal with them,” Marks said. But there was another reason, too, that she gave the exhibit its name: while working on the project, she often felt ignored. Whether it was due to homeless people’s sense of self-preservation, or her awareness that approaching someone on the streets of Honolulu could cause discomfort or suspicion, or her own sense of vulnerability as “a small female, unarmed, with a nice camera,” the difficulty of meeting and connecting with homeless people at some times left Marks discouraged. Marks had also thought she would come away from her trip with “some sort of culmination, or a solution, and idea of what I felt like should be done” about homelessness — but that didn’t happen. “When I got back I just had bits and pieces of everything, sound bites. I never felt like there was ever any uniformity even in the struggle of being homeless, any concrete thread. Every single person’s different,” she said. For now, Marks plans to donate 10 percent of the profit from the show to the Boat Harbor community in Waianae, which she said is a “large and unified community” that is fighting for their right to stay on public land.